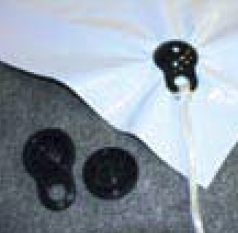 Tie-Down Buttons and Tarp Grabbers help keep plastic sheeting securely in place. Tie-Down Buttons are designed to eliminate traditional grommets in plastic sheeting up to 10 mil thick and are reusable plastic fittings that are easy to install in any position. Tarp Grabbers are up to 4 times stronger than a brass grommet and are typically used in heavier plastic sheeting from 10 mil to 30 mil thick. Great for equipment covers, large storage covers and truck tarps. Click here for Product Data Sheet.